An inexpensive way to change the appearance of your bathroom is to give the towels a new look. Coordinate the hand and bath towels in a similar theme for a unified look. You can create bath towel embellishments without a lot of sewing skills, but having the basic ability to stitch by hand or machine is helpful. 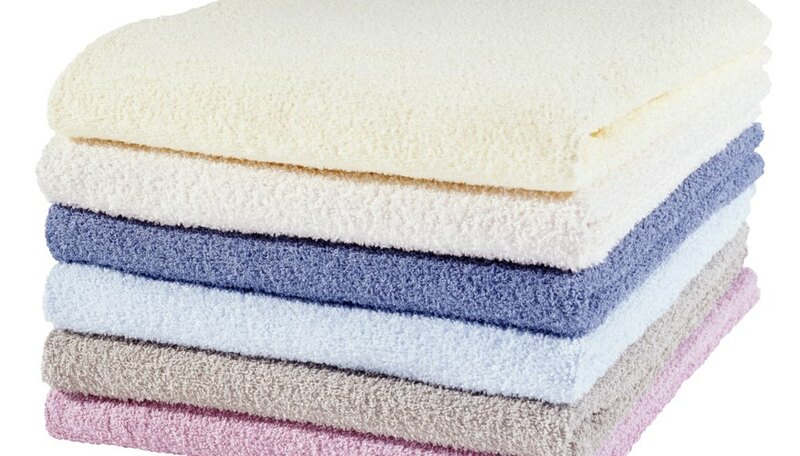 Fusible products are not good for towels because the terry-cloth looping will not lie flat. Adding a monogram gives even the most-inexpensive towel a rich, customized look. You can embroider a monogram by hand, but it looks more professional when you use machine embroidery. If you use machine embroidery, you will not have to worry about transferring a pattern onto the towel. If you hand-embroider, iron a ready-made transfer onto the towel. If transferring an original design onto the towel, use carbon paper. The loops on terry cloth present some challenges when transferring designs with carbon paper. For best results, smooth the towel onto a flat, hard surface like a cutting mat placed on a table. Hold the design in place with a piece of tape that overlaps both the towel and cutting mat. Whether you're using hand or machine embroidery, use two layers of transparent water-soluble stabilizer on top of the towel to keep your stitches from getting lost or hidden in the terry-cloth loops. The excess stabilizer washes away when laundered. Adorn your towels with grosgrain ribbon. Since the edges of ribbon are finished, don't worry about fraying. Start with a ribbon that is not an exact color match to the towel; instead, choose ribbons in a color that picks up a small amount of the towel's color, or find ribbons that repeat a design element or motif from the bathroom. Let the design of your towel determine the placement of the ribbon. If the towel has a flat section a few inches above one edge, choose a ribbon to fill that space. On plain towels, stitch your ribbon at the edge of the towel's width, or sew a ribbon within an inch from both sides of the towel's length. Alternatively, place the ribbon across the width of the towel about a quarter way up from the edge. To affix the ribbon, position it on the towel, bring the ends a few inches onto the back side of the towel or let them meet in the center. Fold the ends under, and stitch all the way around the edges of the ribbon. Appliques are pieces of fabric sewn to another item. To decorate a towel with an applique, for example, look through coloring books or clip art to find a shape you like. Print or copy the design, then trace the pieces onto fabric. Recreate design motifs in the same way. If your room wallpaper has an image you would like to replicate in applique, copy a scrap or scan and print the image. If you don't have any scraps from which to work, take a photo of the design to trace, using carbon paper to mark the designs onto the towel. To sew the appliques in place, use a machine zigzag or satin stitch around the edges of the design. If using hand stitches, turn under the applique edges, sewing with a blanket or running stitch. Embroider designs onto your towels by hand or machine after you have ironed or copied on the design with carbon paper. For best results, concentrate embroidery in areas without terry-cloth loops. For this blank strip area, look for designs that fit neatly into it such as vines, flowers or motivational phrases. Embroider tiny flowers, berries, leaves or small holiday designs along the hem areas. Designs with a lot of detail are difficult in the hem areas due to lack of space; instead, use the decorative stitching options on your sewing machine. Experiment on an old towel first. Use colorfast embroidery threads so colors won't bleed or fade during laundering.